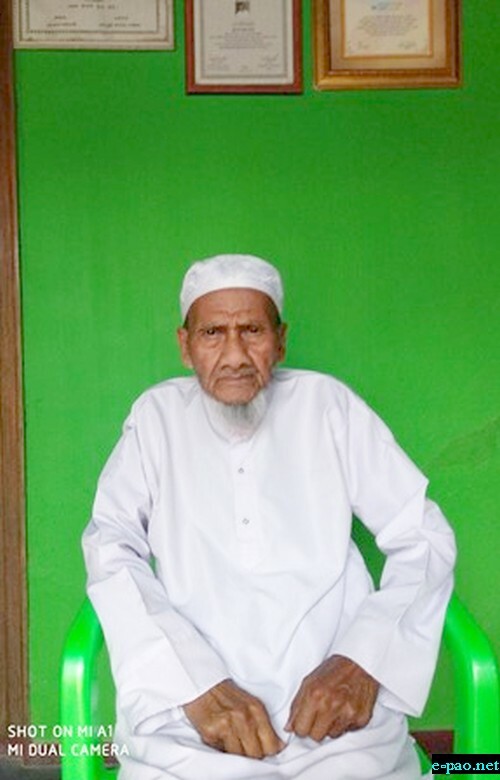 "Muhammad Abdur Rahman Khutheibam (2nd January, 1935 to ....) was born in a poor family at Khetrigao Village, Imphal East District. He was born to Kutheibam Sifat Ullah (father) and Kutheibam (ongbi) Moinam Zuhra Bibi (mother). His mother gave birth to three children, of which, Rahmam was the eldest. His father being a teacher of Ghajjal took keen interest in culture and heritage and established Keikhu Balika Lower Primary Madrassa (1986) to educate girls. M Abdur Rahman started religious education with Arabic Kaida (foundation) when he attained 4 to 5 years of age. His father was his first teacher. The reason for learning Arabic language was to enable to read Holy Qura'n, carry out Namaz (daily prayer) and establish religious faith. Next, he began to learn at Khergao Lower Primary School. He went to appear Class II examination in 1942 at Porompat Lower primary School. It was coincided with Second World War. The students were allowed to write answers in the slate (thin piece of hard flat material) and he was declared pass Class II on the same day of the examination. He could complete classes III to X (1943 to 1950) at Churachand High School. Later, he could clear the matric examination, 1951, conducted by Gauhati University. Then, he took admission to DM College, Imphal, to study IA (Intermediate of Arts). He could not complete the courses of College due to poverty. However, he did not stop self-study and self-research. He completed hindi language course 'Parichai' and also 'Kobid' so he used to have workable knowledge of Urdu, Hindi and English. He was one of a voracious reader and used to read many subjects of his interest. He used to read journals/monthlies viz. Awake (Transval, South Africa), Islamic review (Woking, England), Al Ittihad (USA), The Light (Lahore, Pakistan), Islamic Voice (Bangalore, India), The Radiance (New Delhi, India) etc. His answer with smile to a question about his qualification was, "I am still a student". Still he was working very hard and he believed that it increased his knowledge. Due to poverty he used to search jobs. He got a job at Imphal Post Office and he started working at Branch Post Office, Khetrigao. After some years he was transferred to Jorhat Post Office. By then Jorhat post office was under Imphal Post Office. He had not gone to Jorhat due to lack of manpower at home. Thus, he gave up his hard earned job. Later on he joined Fatima Memorial High School in 1954 as a teacher. Now, the school is not existed. Finally he became a lower division clerk in Agriculture department only to become an Account Officer later on. He got much training in the field of accounting from Office of the Accountant General, Shillong (1965-66), Institute of Secretariat Training and Management, New Delhi (1978) and State Academy of Training, Imphal (1989). He got retirement from his service in 1993. In the year 1954, M. A. Rahman got engagement with Epham Amina Khatun, D/o Qazi Sanajaoba. His father-in-law was a nominated Qazi in the palace of Maharaja Churachand Singh (1886-1941). Rahman inherited five sons and two daughters. He took keen interest in sports also. His favorite sporting events were hockey and football. Above all he used to play Mukna (traditional Manipuri wrestling). He takes interest in other's culture and treats other communities equally. To him there is no division of higher and lower class (mangba sengba) of human beings. He believes in unity and communal harmony. The following organizations/associations are/were associated with him. He takes interest in continuous learning and research. This habit in him has paved him to become a writer. He started his contributions mainly poems and stories in Thoudang (1957), Payame Islam (1962), Mingshel, Ritu etc. His findings of Pangal Folksongs were published in Ritu. Later on he along with Kayamuddin Pukhrimayum published a co-edited volume entitled "Pangalgi Khunung Eshei" (1986, Published by Liberty publishing Association, Imphal). He feels that he is filling the gap of not having large number of Meitei Pangal writers. He used to write and read out series of research papers on literature in the seminars held at Manipuri Dept., Manipur University. He has helped many research scholars. He wrote many articles based on Islam in the dailies under the pen name 'Alam'. His books and booklets in Manipuri language are of two categories for e.g. Islamic literature and General literature. These are as the following. Apart from his contributions in Manipuri literature, he contributed in English language also for e.g. the part written about the Meitei Pangals In: N.Sanajaoba (ed.) Manipur Past and Present Vol. IV, Mittal Publications, New Delhi, 2005. M. A. Rahman used to have long vision and short in speech. He has taken his interest of a writer as a challenge that he has not stopped writing. During his career as a writer he gave up leading a luxury life to that extent of ridiculing by others in this regard. Recognizing his contributions in the field of literature, he was awarded the following honors till date from different sources. ⚛	Sahitya Bhushan, 2003 (Prestigious Literary Award, Given by Manipuri Sahitya Parishad). He is the first among the Meitei Pangal writers to have bagged this award. The writer (L) Kayamuddin Pukhrimayum was also awarded Sahitya Bhushan posthumously.